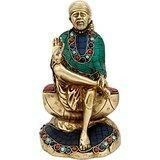 Hindu God Brass Sai Baba of Shirdi, also known as Shirdi Sai Baba, was an Indian spiritual master who was and is regarded by his devotees as a saint, fakir, and satguru, according to their individual proclivities and beliefs Sai Baba is worshipped by people around the world. He had no love for perishable things and his sole concern was self-realization. He taught a moral code of love, forgiveness, helping others, charity, contentment, inner peace, and devotion to God and guru. He gave no distinction based on religion or caste. Sai Baba's teaching combined elements of Hinduism and Islam,Size : 8.5 Inches Height X 5 Inches wide X 4 Inches depth. Weight : 2.5 kg. Material : Brass , With Turquoise and other coral stone Handwork.